There are currently two 3-day workshops for up to four students each. These workshops will take place at our studio located in the Crafts Village of the Ozark Folk Center State Park in Mountain View, Arkansas. The second class is scheduled May 15 – 17, 2017 For more information, please visit the Ozark Folk Center Website. We also offer independent study one-day workshops. Please contact Racheal Mathews to arrange a time. Additional information is available on the Ozark Folk Center’s website. We have a 24 page Procedures Manual and Equipment List that can be purchased for $30. Contact us for purchase information. The Procedures Manual on Flame Painting Copper is a great way to get started in this unique art form. It comes with an Equipment, Tools and Materials list that we have compiled over the years which includes where to find these essentials for flame painting. The Manual has 51 years of combined experience in flame painting from Skip and I and 6 years of teaching this medium as well. 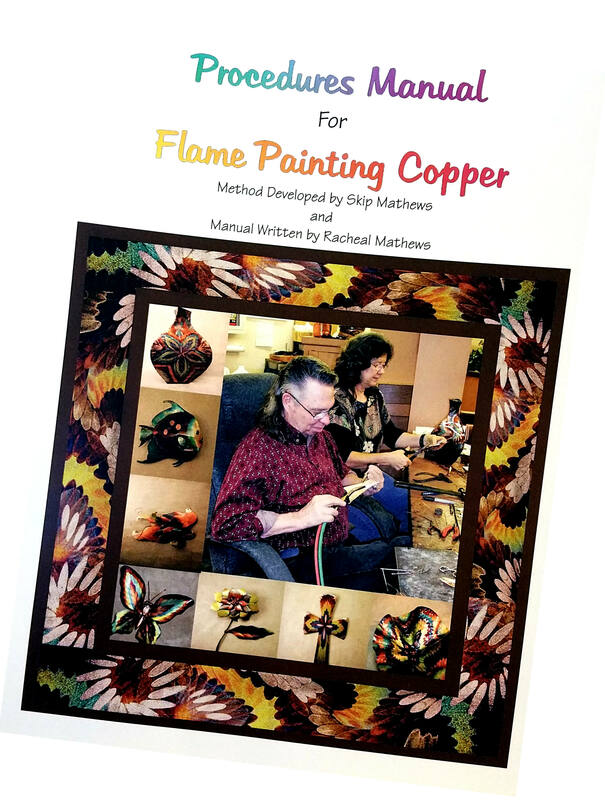 The Manual comes with our story here at Copper Colorists, what flame painting really is, the procedures for drawing and painting copper with a flame – a long version with much detail and a short version to set up next to you as you begin building skills with the flame. It also includes illustrations for the two flames needed to draw and paint, the positions of the torch for soldering, drawing and coloring, and of course color charts for the ground colors and the reduction colors. There are tips for adjusting your flame for each procedure, more notes on the colors, and a list of the rules for getting the best colors. You will be able to watch our two videos from our website to gain understanding as well. If you would like to order the Manual, just contact us and give us your mailing address and your phone number so we can call for payment. The Manual is $30 plus $4 for shipping. That’s it.